When a woman naturally transitions out of fertile years, the ovaries run out of eggs. This, thus, leads to a drastic decrease in estrogen during postmenopause as the eggs were the major producer of estrogen. 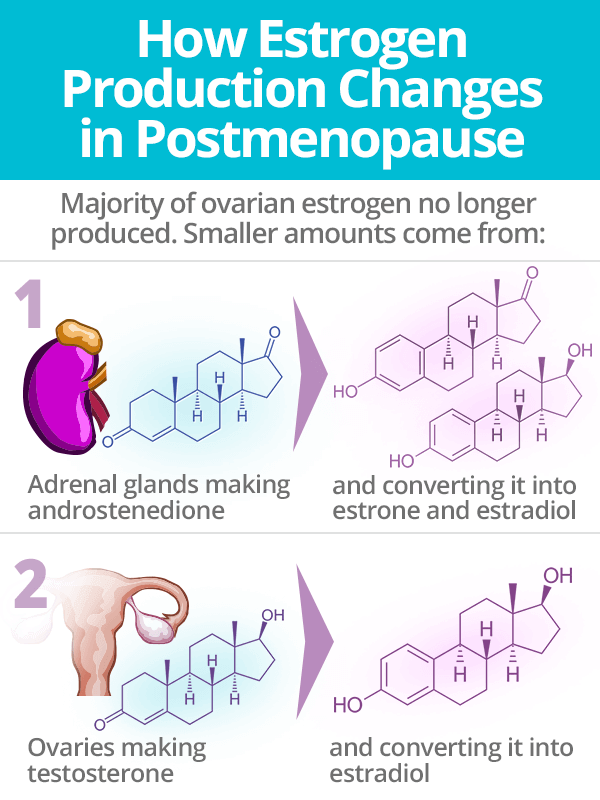 Continue reading to learn more about how estrogen production sites change as well as possible life-threatening health risks associated with this crucial milestone in a woman's reproductive life. For decades of a woman's life, the ovaries contributed to a substantial amount of the body's estradiol. When the ovaries stop reproductive functions, blood estrogen levels drop dramatically, as much as by 90%. Yet, although they cease production of estrogen, ovaries continue to make testosterone in small amounts, which can be converted to estradiol in body fat. Additionally, adrenal glands synthesize androstenedione, which can be converted to estrone and estradiol in body fat by enzymes. 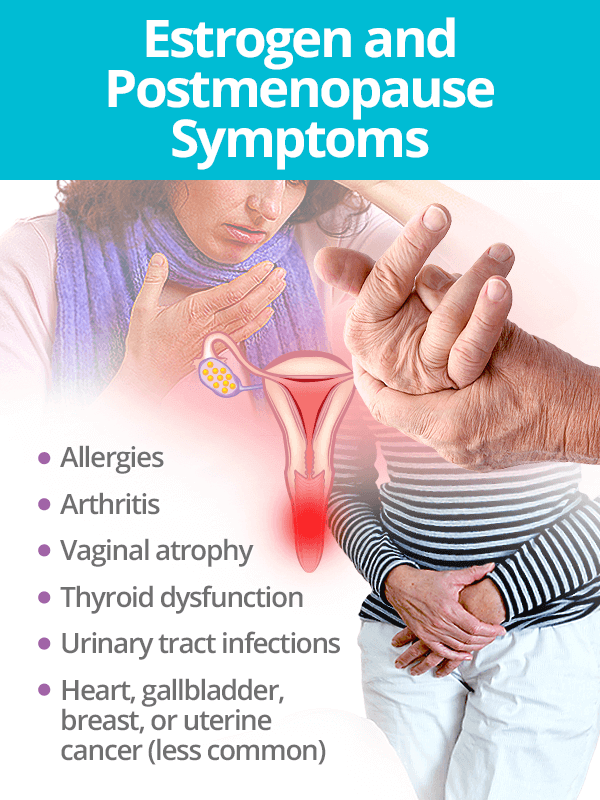 Keep in mind that even during postmenopause, estrogen roles in the body are varied, including maintaining a thick and lubricated vaginal lining, preserving the epithelial lining of the urethra, upholding skin tension, regulating cholesterol production, sustaining blood vessel flexibility, regulating bone mass, and more. 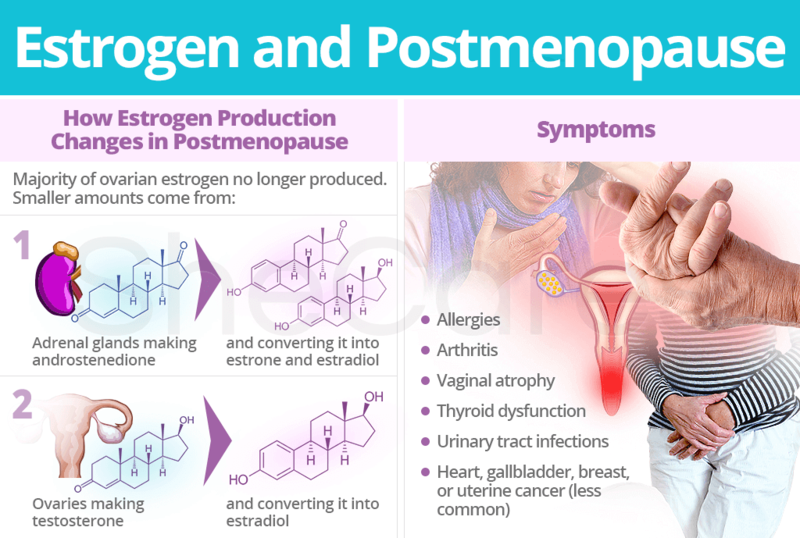 Aside from symptoms that are customarily associated with the transition into postmenopause, there are additional concerns for postmenopausal women due to consistently low levels of estrogen and other hormones. Understanding the importance of estrogen throughout life is a crucial step in being aware of an imbalance's possible effects in the body. Having low or high estrogen levels brings about its own list of distinct signs and symptoms. Continue reading to learn more about causes, signs, and symptoms of estrogen levels within the two extremes.